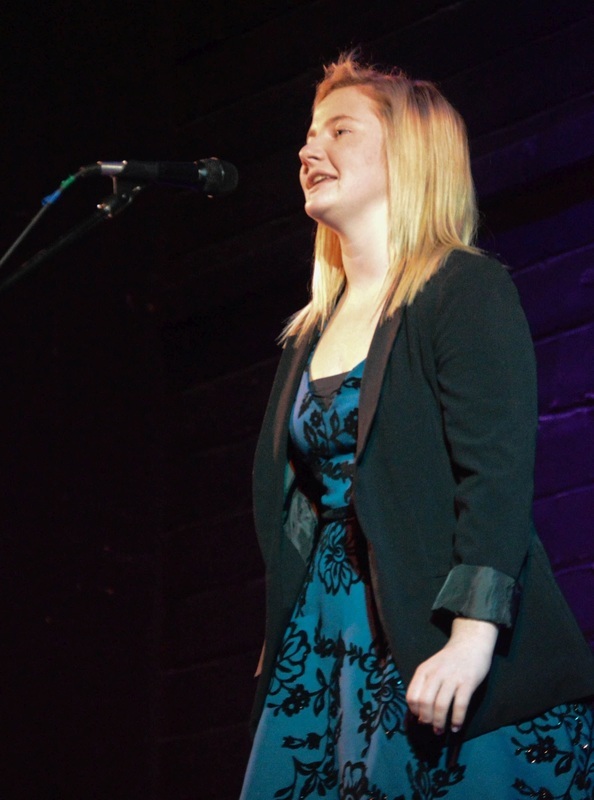 On Wednesday evening, January 18, over two dozen Ridgefield High School students braved the pouring rain to take center stage at The Old Liberty Theater to recite the works of both famous and lesser-known poets in the school-level round of the national Poetry Out Loud competition. Grace Melbuer, a sophomore, earned first place, with a recitation of Rita Mae Reese’s poem, “Dear Reader.” Natalie Dean, a senior, finished second. Davin Tjia, a sophomore, and Kendall Davis, a freshman, tied for third-place honors. This is the fifth year that Ridgefield High School has competed in the Poetry Out Loud contest, and members of the English Department continue to be impressed each year with the quality of the presentations given by their students. To prepare for the competition, all RHS English students selected and memorized a poem chosen from an anthology of more than 900 classic and contemporary poems. English classes held competitions where students recited their poems in class. Students were evaluated on their physical presence, voice and articulation, dramatic appropriateness, and ability to convey the poem’s meaning to audience members. Classroom winners and a wild-card advanced to the school finals. This year, students benefitted once again from the professional guidance of Katherine Murphy Lewis, co-founder of the non-profit arts group, From the Ground Up. Murphy Lewis worked with groups of RHS students, presenting workshops and tutoring small groups in individual classes to prepare for the contest. The English department was able to bring Murphy Lewis in through a grant from the Ridgefield Public Schools Foundation and a generous donation of her time. The district is grateful to the staff at The Old Liberty Theater, who hosted the competition. We congratulate Grace and wish her the best as she advances to Poetry Out Loud’s Southwest Washington Regional Finals at Educational Service District #112 on January 30th at 5:00 pm.